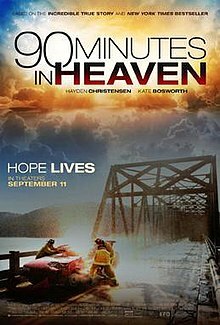 90 Minutes in Heaven is a 2015 Christian drama film directed by Michael Polish and starring Hayden Christensen, Kate Bosworth, Dwight Yoakam, Michael W. Smith, and Michael Harding. It is based on the bestselling novel by the same name. It is the first film by Giving Films, a sister company to retail chain Family Christian Stores, and though the company announced plans to donate all profits from the film to charitable organizations, the poorly reviewed film showed a loss at the box office. Don Piper is involved in a horrific car crash, pronounced dead at the scene and covered by a tarp. Ninety minutes later, having been brought to a hospital, he returns to life and claims to have seen Heaven and visited with deceased relatives while there. The project was shot in Atlanta, Georgia, and the shooting finished in March 2015. Since its publication, Don Piper's book was twice on the New York Times Best Seller list, was listed as a USA Today best-seller, and has sold 7 million copies in 46 languages. Actress Kate Bosworth stated she "was amazed how Piper's story affects so many people" and that she felt blessed "to be a part of the movie's cast." Filming began in January 2015, and by March 8, 2015, filming had wrapped and the project went into post-production. 90 Minutes in Heaven was released on DVD and Blu-ray on December 1, 2015. 90 Minutes in Heaven has received negative reviews from critics. On Rotten Tomatoes the film holds a rating of 24%, based on 21 reviews, with an average rating of 4.4/10. Metacritic gives the film a score of 28 out of 100, based on reviews from 9 critics, indicating "generally unfavorable reviews". ^ Busch, Anita (2015-07-08). "Trailer: Hayden Christensen's '90 Minutes In Heaven'". Deadline Hollywood. Retrieved 2015-08-06. ^ EVO Entertainment. "90 Minutes In Heaven". EVO Entertainment. Retrieved 2015-09-01. ^ Fleming, Mike (2015-01-07). "Family Christian Retail Chain To Make '90 Minutes In Heaven' Movie". Deadline Hollywood. Retrieved 2015-09-01. ^ "90 Minutes in Heaven (2015)". Box Office Mojo. Retrieved October 12, 2015. ^ a b Lopez-Mitjavile, Diana Lyn (January 12, 2015). "Pastor's near-death experience made into movie, starring Kate Bosworth, Hayden Christensen". Christian Today. Retrieved May 25, 2015. ^ Schuster, Shawn (March 12, 2015). "'90 Minutes in Heaven' Film Based on Best-Selling Book Expected to Release This Fall". The Gospel Herald. Retrieved May 25, 2015. ^ a b Jones, Brandon (January 31, 2015). "'90 Minutes In Heaven' Goes Into Production, New Site Up With Kate Bosworth, Hayden Christenson". The Global Dispatch. Retrieved May 25, 2015. ^ Allen, Bob (March 27, 2015). "'90 Minutes in Heaven' headed to big screen". The Baptist Standard. Retrieved May 25, 2015. ^ a b Yapching, Mark (March 16, 2015). "'90 Minutes in Heaven' wraps up filming in Atlanta". Christian Today. Retrieved 21 May 2015. ^ "WATCH: '90 Minutes in Heaven' Film Tells Riveting Story of Life After Death" (text and video). Charisma Magazine. Religion News Service. Retrieved 21 May 2015. ^ Carballo, Charlie (February 23, 2015). "Hayden Christensen is unrecognizable in 90 Minutes To Heaven with red hair". Daily Mail. Retrieved 21 May 2015. ^ Fleming Jr., Mike (January 7, 2015). "Family Christian Retail Chain Forms Film Shingle With ' 90 Minutes In Heaven '". Deadline Hollywood. Retrieved May 18, 2015. ^ staff (March 5, 2015). "'90 Minutes in Heaven' filmed in Buckhead". The Marietta Daily Journal. Retrieved May 25, 2015. ^ Law, Jeannie (March 12, 2015). "Don Piper's '90 Minutes In Heaven' Movie Ends Production: Kate Bosworth, Michael W. Smith & More Appear in Leading Roles" (text and video). Breathecast. Retrieved 22 May 2015. ^ Conrad, Michael (March 12, 2015). "'90 MINUTES IN HEAVEN' Wraps Atlanta Filming". Religion News Service. Retrieved May 23, 2015. ^ "Piper's '90 Minutes in Heaven' back on 'New York Times' best-seller list". Christian Retailing. 25 April 2014. ^ staff. "90 Minutes in Heaven". Christian Film Database. Retrieved May 23, 2015. ^ a b c Ong, Czarina (May 23, 2015). "90 Minutes in Heaven producer explains why they stayed faithful to Don Piper's book". Christian Today. Retrieved May 23, 2015. ^ Koonse, Emma (January 15, 2015). "Family Christian Entertainment 'To Be the Disney' of Faith-Based Films As '90 Minutes In Heaven' Enters Production". The Christian Post. Retrieved May 25, 2015. ^ staff (March 14, 2015). "'90 Minutes In Heaven' Wraps, Still Set For 2015 Release". The Global Dispatch. Retrieved May 25, 2015. ^ White, Chelsea (March 8, 2015). "'In heaven!' Kate Bosworth and her director husband Michael Polish share a kiss to celebrate wrapping their new film". Daily Mail. Retrieved May 25, 2015. ^ "90 Minutes in Heaven DVD and Blu-ray". dvdsreleasedates.com. Retrieved 2015-12-16. ^ "90 Minutes in Heaven". Rotten Tomatoes. Retrieved January 30, 2016. ^ "90 Minutes in Heaven reviews". Metacritic. Retrieved September 17, 2015.